We are offering two types of Model NVC-400A, first type is for 1 channel and second type is for 4 channels. Both types have a "PASSWORD Check System", once PASSWORD's parameter was preset to "ON", arbitrary change of preset measuring data at the actual production line cannot be done except for the person in charge of Quality Control. As to 31 patterns of measuring conditions can be stored into EEPROM, it is capable to cope with various kinds of Test Piece (bulbs) easily by means of changing Work Number. Functions such as wrong wiring checking and missing parts checking are also available. Best suitable for both mass-production items and various-kinds & small quantities items. 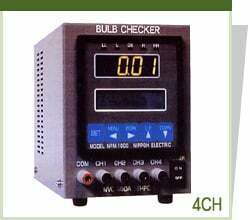 Unbelievable price on Bulb Checker NVC-400A in Seremban (Malaysia) company Bestever Enterprise.